For anyone who needs an added assurance and the protection of personal safety and security devices, the INDEpendant is a necklace-sized personal security alarm. 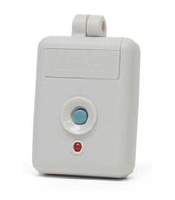 This stand alone, interactive emergency alert system requires only a telephone line and an electrical outlet. It is ideal for individuals and families who want a personal alarm system which monitors the person as opposed to the property. With the touch of one button, you can speak to an operator. If you are unable to provide a response, authorities are contacted. We can even install a lock box with keys to your premises, in the event emergency personnel need to enter your home or office.